A broken laptop screen can be a source of great frustration. However, the laptop screen replacement process is much easier than you might think. In replacing our damaged Lenovo Ideapad Z575 screen yourself, you could save valuable time and money. Below, you'll find step by step instructions to help guide you through. Before doing anything else, make sure that you have unplugged your laptop from the mains power, remove the batter and disconnected all peripheral devices, (such as memory sicks and speakers.) Once you are ready to begin, locate and remove the aesthetic screws covers disguising the screws at the bottom corners of the front bezel. Note: to remove the covers hiding the screws, you'll need to use a flat-edged implement and/or a plastic opening tool. Once you have removed, (and set aside,) the plastic covers that hide the screws, remove the screws underneath and, set them aside, also. Firmly, (but gently,) prise the front bezel away from the rest of the screen casing. Note: the front bezel is held in place by a number of clips, rather than tape or adhesive. Work your way around the outer edges of the front bezel, carefully lifting it away from the damaged screen. Once you are sure that you have loosened it sufficiently, pull the front bezel away from the machine and, set it aside safely. In the top corners of the exposed screen, you should see two further screws holding the damaged display in place. Remove these screws also, and set them aside safely. At the bottom of the exposed screen, you should see four further screws. Note: don't completely remove the screws at the bottom of the exposed screen. 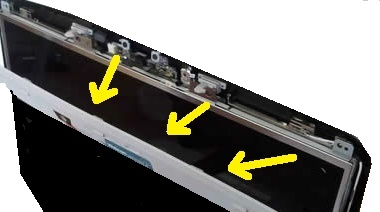 Pull the top of the broken screen slightly towards you, proceeding to remove the small cable which connects the top, (and back,) of the screen to the machine's webcam. 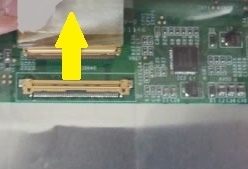 Having removed this cable, pull the screen further towards you and remove the screws found on either side of the newly exposed, (left and right,) sides. Having removed, (and set aside,) these screws, pull the broken diplay towards you and lay it, (face down,) on the machine's keyboard. At the back of the screen, you should see two further cables that you'll need to disconnect. 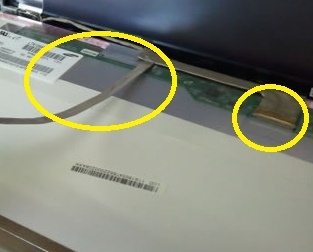 Once you have disconnected both of these cables, you should be able to remove the damaged Lenovo IdeaPad Z575 screen from your machine. To fit your newly bought replacement screen, simply complete the above instructions in reverse.